Both vegetables should be washed thoroughly to get rid of any lingering garden soil, then chopped. The easiest way to cut kale is to pull leaves away from the stem, then give the leaves a few crosswise chops. (You can toss the stems into a freezer container and use them to make a healthy stock later.) 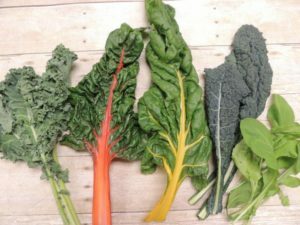 For chard, just pile a few leaves, stems and all, one atop the other and give the whole thing a few rough chops in both directions. For easy sautéed greens, just add a tablespoon of oil or butter to a skillet, turn the burner to medium, fill the pan with greens, cover, and cook until they begin to wilt. The big mistake people make when cooking greens is to overcook them. To add more flavor complexity, cook with a couple of garlic cloves or some chopped onions. Add other seasonings to taste. Cook more than you need for one meal and refrigerate the extra portions for the next day. Cooked chard can be added to a stir fry or an omelet. It’s also an excellent bed for scrambled eggs, adding lots of vitamins and minerals to your breakfast menu. Kale cooked with potatoes makes for a hearty dish. Boil as many potatoes as your family typically eats. Then cube them. Meanwhile, sauté a couple of minced garlic cloves and/or a half-cup or so of chopped onion in oil. Add the cubed potatoes and let them cook on medium to medium-low heat until their edges brown a bit. Add a good-sized bunch of chopped kale, cover, and simmer for a couple of minutes. Season with salt and pepper, as desired. It’s easy to make, keeps for days in the fridge, and gets more tender and tasty with each passing day.